Below are a few of the common questions we receive. Please don’t hesitate to contact us if you have others. What is the process involved for creating my new website? Once you’ve accepted our proposal and have made your initial deposit, you’ll receive your Welcome Packet with details about the next steps. 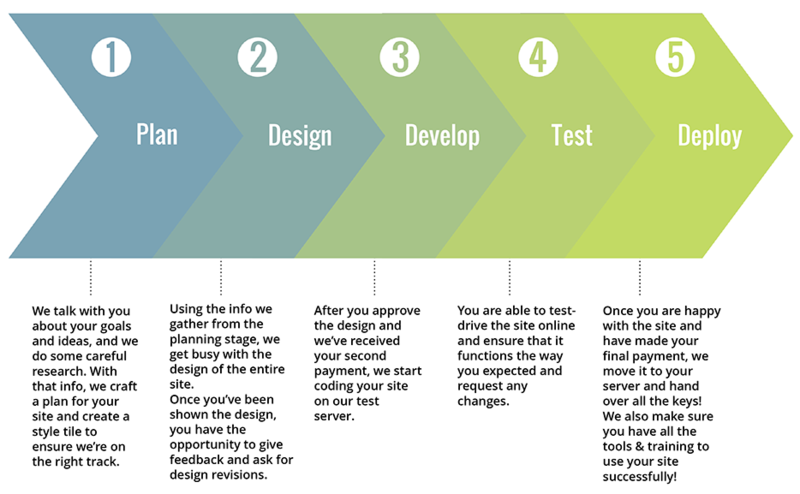 From there, we will set up a website planning call with you to discuss all of the details of your site. It’s really comprehensive, so be sure to come prepared with your homework! What is the difference between a Custom Site and Genesis Theme Customization? We believe that there are no one-size fits all solutions when it comes to delivering results that translate into successes for your business. Therefore we offer custom pricing for each project. This pricing is based on your business needs and goals and the solutions involved. Genesis child theme* setup starts at $1,150 for install and setup like the theme demo + installing your logo, and color scheme and font changes. Pricing changes from there are based on any specific structural changes you request for the theme and/or any other requirements, such as adding or moving content. Custom built sites start at $3,150 and are based on your business needs and goals for the site, as we create customized solutions and code custom sites for all of our clients who choose this option. We are available via email and phone, but for project management we use a project management tool to keep things organized. This tool will send notifications, due dates, and allows you to see how the project is moving forward. HOW LONG DOES IT TAKE TO FINISH A WEBSITE/BLOG DESIGN/VIDEO etc? This varies based on a couple of factors: 1) the scope of the project and 2) how quickly we receive feedback and information that we request throughout the project (communication is important!). Please let us know the deadline for your project and we will work to accommodate you, or let you know what is possible within that time frame. Will you charge me if I ask you questions via phone or email? If we are working on a project together, that is built into the project pricing. If we are not currently working on a project together, I’m still happy to answer your questions, but if it is something that takes me away from my current clients, eg. something that I need to research, then my hourly rate will apply. All major credit cards, debit cards, and e-checks are accepted through PayPal. You do not need a PayPal account to make a payment. We also accept checks through the mail. Please note that all checks will need to clear, prior to starting or handing over a project.